Always Have Tape Right There When You Need It. Imagine a roll of tape that you never loose. This unique little device allows you to always have tape right a your finger tips. You will never be left looking all over for the tape again. This dispenser fits over the broad part of your hand and leaves you with two free hands for wrapping presents, doing crafts, scrap booking, doing office work or any other task. You won't lose this tape mid-wrap because it remains firmly in place, right on the top of your hand. It uses and standard size, 3/4 inch tape refill (not included). If you've ever wrapped a gift, its easy to see how this little tool can make things easier and faster. Convenience and ingenuity have come together to create this useful little item. 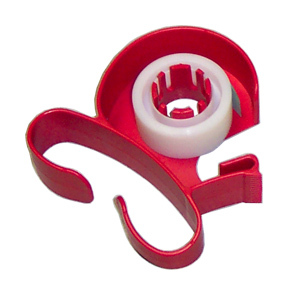 The hands-free tape dispenser is truly a time saver and helps to simplify many tasks. You won't have to worry about losing your tape in the middle of a project again. Leave two hands free to work and dispense tape at the same time. This is great for gift wrapping, scrap booking, in the office, for crafts and more. It is one size fits all and adheres snuggly to anyone's hand. Hands-Free Tape Dispenser - Dispense tape while leaving your hands free to do other things. Always have the tape you need right at your fingertips. Makes wrapping presents and other tasks quicker and easier. Order yours Today! This tape dispenser made wrapping Christmas presents much easier. It stayed on my hand and cut the tape well. The item arrived earlier then expected. Great communication from company. It was my first time ordering from this site and I am happy with the product and buying experience. The usefulness of this item is great! However, 7 of the 20 units ordered were defective. The company sent good replacements quickly at no charge and defective did not have to be returned. I thought I would never find a replacement for mine but thanks to this place I did and ordered two..I love these handy gadgets. Makes taping packages a lot more easier. The hands-free tape dispenser is not available in Germany (and Europe?) anymore so I was happy to be able to purchase it from simplygoodstuff. It does exactly what it is supposed to do. It is a very plain product, no nonsense accessories. Let the wrapping begin! I do not know how any household, especially during the holidays can be without this clever dispenser. I actually put two on my left hand...one with regular tape and the other with double stick tape. I am a hands-free wrapping machine thanks to these. They make great stocking stuffers as well.And remember 2 is better than one. Got one of these as a gift from a coworker years ago and found it the handiest tool for wrapping gifts. No more pulling out pieces of tape and sticking to the edge of a table; no need to buy special refills that limit you to a single length of tape. This dispenser fits easily on my left hand is not in the way as I wrap a gift, but right there and easy to pull any length of tape I want when I am holding down a fold or edge of paper. This year I bought 6 to hand out to each of my sisters and neices. This tape dispenser is ingenious in its simple design. It just slips over your hand & leaves both hands free to smooth your wrapping paper & ribbons into a tight, neat package. No need to fumble around for the tape while trying to hold the edge of the paper together. I had one of these for years before it broke & I tried to find it in several stores with no luck. I was so happy to finally find it that I bought 2 just to be on the safe side. The dispensers are a great price & shipping was quick. I've used these for years and the one I had, the edge was wearing out. I was so happy to see that you carried them I bought two and I have to say, they certainly make my gift wrapping much easier. I had bought some of these at a discount store many, many years ago. After they had been "borrowed" or finally broken I went looking for more and could not find any until I saw them on SimplyGoodStuff.com. They are some of the most useful and handy gadgets. It is easy to secure a package with tape using them. The position on the hand makes it easy to secure the area to be taped with one hand and have the tape readily accessible. Service from SimplyGoodStuff.com was great. The dispensers arrived quick and in perfect shape. I absolutely love this product, especially at Christmas time with so many things to wrap. I orginally bought this years ago and one of my kids broke it a few months ago; I was so happy to find it still available so I bought a few of them in case they stop making them; once you use it you don't want to wrap anything without having this on your hand. No Tools and No Studs! Hang up to 150 lbs. Free Laser Level! Pre-Cut, Commercial Grade Replacement Line. 12 inches long, .095 diameter. An Easy Way To Wrap Presents With Perfect Results.